The Historic Preservation Trust of Berks County will receive an award for restoration work performed on the Johan DeTurk House. The award will be presented by Preservation Pennsylvania at a ceremony on September 30, 2011, in Gettysburg, PA.
Preservation Pennsylvania is recognizing the DeTurk project with the award for Restoration of a Special Historic Property. Several structural elements of the 244-year-old building were threatening to fail. 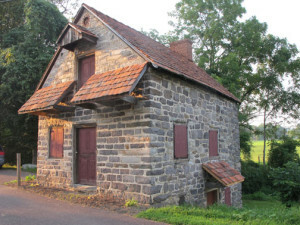 The Trust stabilized timber support-beams and masonry bearing-walls, mitigated chronic drainage issues, restored access to the cellar kitchen, and re-established exterior façade details. The Trust would like to thank project architects Ortega Consulting, principal contractor Victorian Heritage, Inc., and generous supporters: the William Gotwals family; Oley Valley Heritage Association; numerous individual and corporate donors; Trust members, officers, and directors; Richard Ortega; and a local foundation devoted to historic preservation in Berks County. The award recognizes the efforts of all involved and celebrates the role the DeTurk House plays in Pennsylvania’s historical and architectural heritage. If you would like to join Trust representatives at the awards luncheon, your reservation (and payment) must be received by Preservation Pennsylvania before August 31, 2011. Seats cost $60 per person. Tickets will be held at the door. Please visit www.preservationpa.org for more information and to purchase tickets.